What does it take to make you happy? How much do you have to have to be grateful? 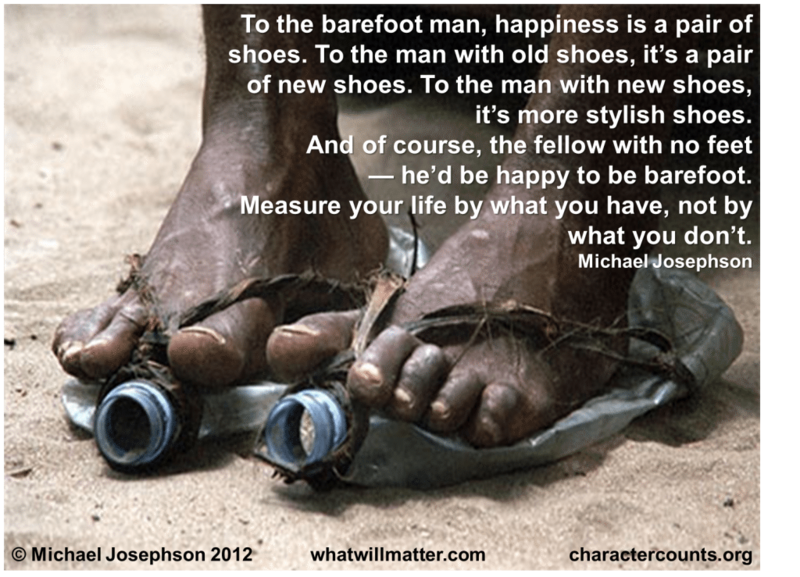 To the barefoot man, happiness is a pair of shoes. To the man with old shoes, it’s a pair of new shoes. To the man with new shoes, it’s more stylish shoes. And of course, the fellow with no feet — he’d be happy to be barefoot. This leads to the ancient insight: if you want to be happy, count your blessings, not your burdens. 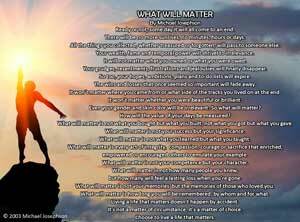 Measure your life by what you have, not by what you don’t. And in our modern world where we are continually exposed to endless increments of more and better — people with more money, better TVs, and bigger houses — this is very difficult. For some people, the pleasure of having something good is drained as soon as they see that someone else has something better. And so, our sense of contentment is created or destroyed by comparisons. A life consumed by unfulfilled wants is an affliction. The antidote is the concept of enough. This starts by thinking more clearly about the difference between our needs and our wants, between sufficiency and abundance. Don’t get me wrong. There’s nothing wrong with wanting more and striving to fill our lives with things and experiences that give us pleasure, so long as we don’t start believing that we need whatever we want. When we think we need what we want, we make the satisfaction of our wants preconditions to happiness, thereby limiting our ability to appreciate and enjoy what we do have. It’s easy to think that happiness is achieved by getting what we want when it is really a matter of wanting what we get. So in the end, enough is enough. I need my manna for today and I’ve risen early to receive it and have the strength to move on until evening comes. What lesson we have in Exodus 16 on provision and being content with “just enough”. Excess becomes a burden and yes, I’ve come to understand that I don’t need what I might want. Enough is enough. The best feeling in the world is give some of whatever you have to someone in need. This was epic and made me reflect on my actions and thoughts. Too true.